I made this magic themed 13th birthday cake for my eldest granddaughter’s birthday. Notice the ace and 3 that I attached to the front of the cake to represent her 13th. 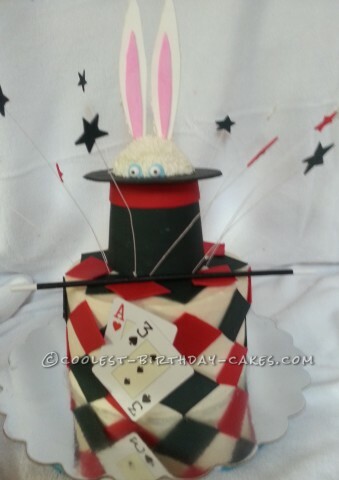 I had seen a magician’s hat cake and a rabbit cake, so I thought I would try to combine the two. Everything on this cake was molded, shaped and cut out of gum paste and fondant except fot the rabbit’s googly eyes. I got those at cake supply shop. The wand is a painted dowel rod from the craft department. Additional pieces were then attached to the cake using piping gel and icing. Unlike the illusion, it is hard to believe my sweet baby girl is now a teenager. She has grown into a smart, sweet and caring young lady right before our eyes. And, just like slight of hand… it happened in an instant. My granddaughter loved the cake by the way… and she loves magic. What she doesn’t realize is that SHE is the magic and always will be.